Simon Black Sovereignly Asks J. Massey WHY Invest in Real Estate? Sovereign Man Simon Black Asks J. Massey WHY Invest in Real Estate? J. was recently interviewed by Simon Black who asked him some pretty interesting questions. One is simple. Why does J. invest in real estate? The answer goes far beyond what you might expect. J. likens investing to a food chain. It’s the Real Estate Food Chain is this analogy. In an actual food chain, it starts with a seed and ends as a finished good. There are all sorts of things that happen in between and the participation of different trusted individuals that make the finished product come into being and then get sold as a finished good. A value is placed on the food goods and we consumers decide to buy or not. It’s much the same in Real Estate Investing. Food or real estate, it’s about supply and demand. J. focuses on buildings with 50+ units and adds amenities to bring up the value for tenants and for his team. The long and short of why he does what he does is that more people are being created all the time. He is following this trend, so he can be there ahead of the curve to provide much-needed housing. He is following trends in his investing pursuits abroad, too. In this interview, J. points out that outside the U.S. real estate investors can leverage the opportunities in housing where the U.S. dollar is accepted. For example, we can build new housing and offer new opportunities in spaces that accommodate living, working, playing and eventually laying. That’s why J. invests in Belize! It fulfills the PLAY component, but also living and working, because he will create jobs and some people will choose to live in the luxury resort village he is helping to develop there. Current trends lead J. to make the decision to invest in paradise: • Ex-pat trend of living outside the U.S. • Baby Boomer trend of their needing cost-effective living • Tourism trends (notice there’s not just one that Belize answers) At the end of this insightful interview, J. Massey makes a special offer. 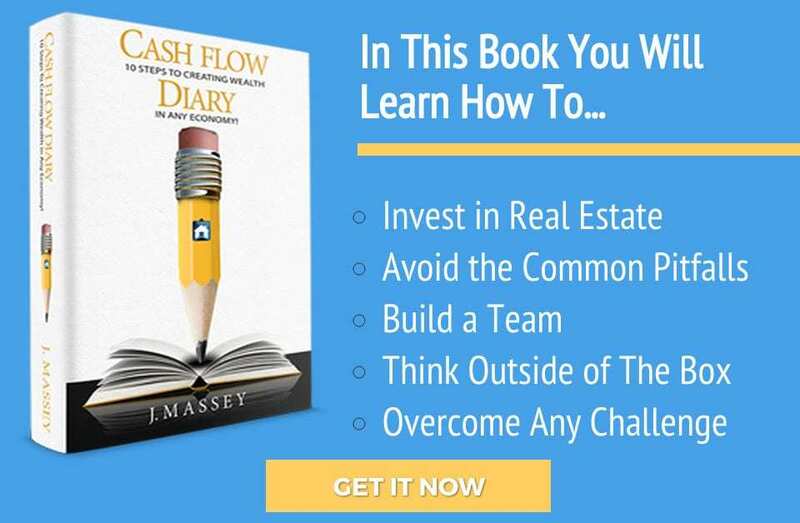 Those who either visit www.cashflowdiary.com/SIMON or those who text “SIMON” to 949.682.3565 will receive at no additional charge the upcoming audiobook release of Cash Flow Diary when they purchase the print version. That’s a pretty sweet deal, because the audiobook will have more content than the print book. J. couldn’t help himself in adding even more value, which is great for anyone interested in becoming a Real Estate Investor or learning even more as a seasoned professional. CFD 076 – “Not my problem,” says J. Massey to a live audience of investors in Phoenix who learn a whole lot about why he’s so successful as an investor. CFD 077 – What are you doing RIGHT NOW to make money knock on your door? More of J. Massey at the Phoenix real estate investors event.